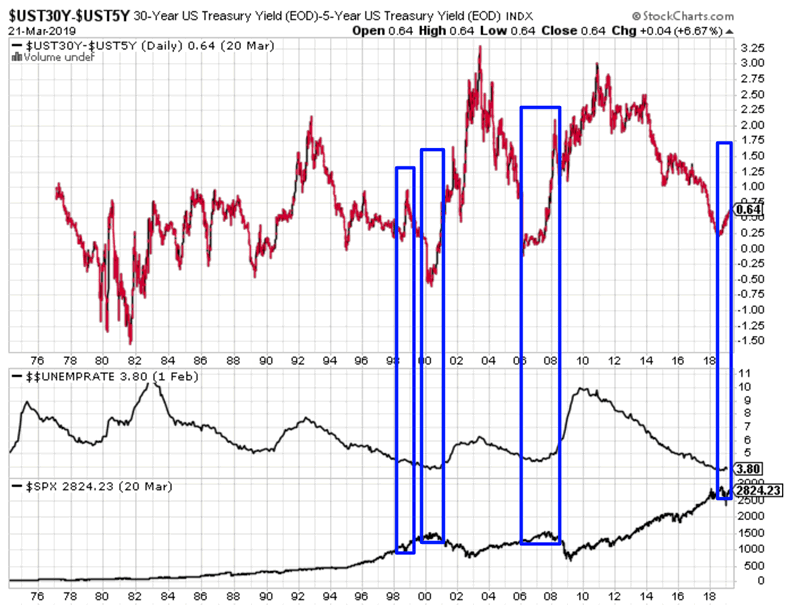 With the 10 year – 3 month yield curve now inverted, it is time to look at the long term bearish case for stocks. The U.S. stock market’s valuation is high. You know it, I know it, everyone knows it. The financial media, financial experts and social media have been saying “U.S. stocks are expensive!” for most of the past 10 years. I have excluded 2 other popular valuation metrics: the stock market’s price-to-sales ratio and Market Cap-to-GDP ratio. Using price vs. sales to measure the S&P 500’s valuations makes no sense. Revenues don’t matter – earnings do. Over the past 100 years, the stock market’s average price-to-sales ratio has increased faster than the price-to-earnings ratio because corporate profit margins are higher. More and more of corporate America’s profits are attributed to the tech sector, and tech stocks tend to have fatter profit margins vs. traditional industries such as manufacturing. In other words, corporate America needs fewer sales to squeeze out the same $X in profits. Using the market cap-to-GDP ratio to measure the U.S. stock market’s valuations also makes no sense. This only makes sense if U.S. companies could only profit from U.S. customers. But more and more U.S. companies are expanding into foreign markets. Hence, it’s only logical for the market cap to GDP ratio to increase overtime. More and more “U.S. 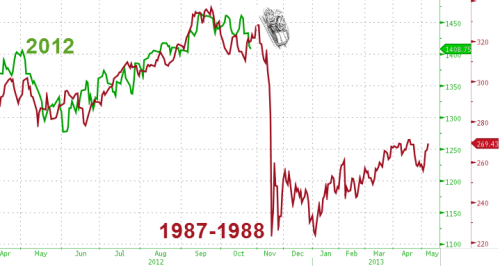 corporate profits” don’t come from “U.S. GDP”. 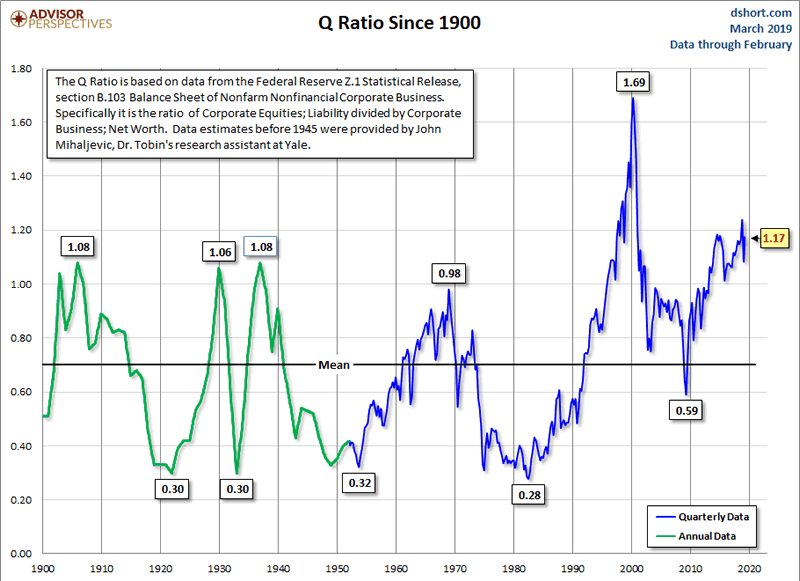 Nevertheless, let’s unpack the first 2 valuation charts: Tobin’s Q and Shiller P/E. 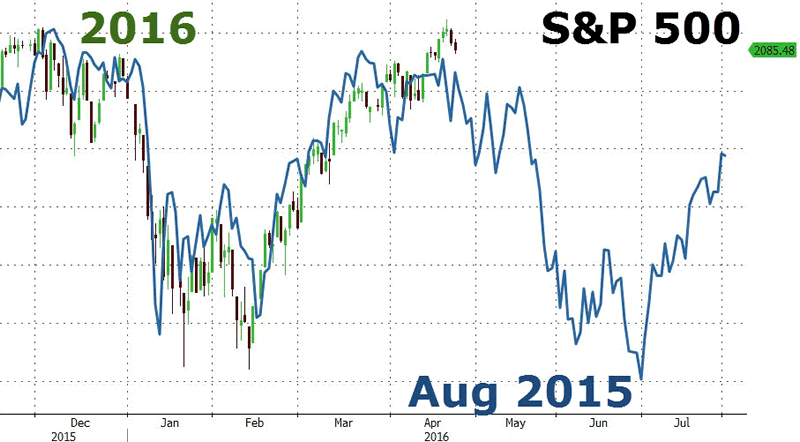 Both of these indicators demonstrate that the stock market’s valuation is extremely high right now. 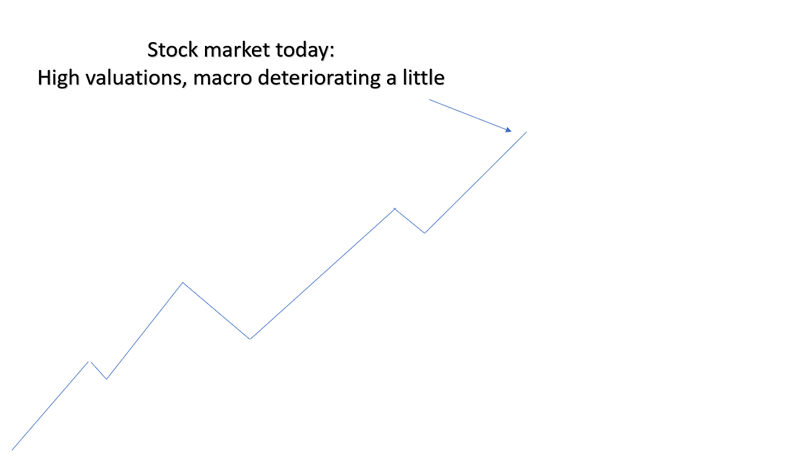 But contrary to what the permabears have been saying for most of the past 10 years, high valuations tell you almost nothing about where the stock market will go over the next 1, 2, or even 5 years. Valuations are a general yardstick for where the stock market will go over the next 10 years. 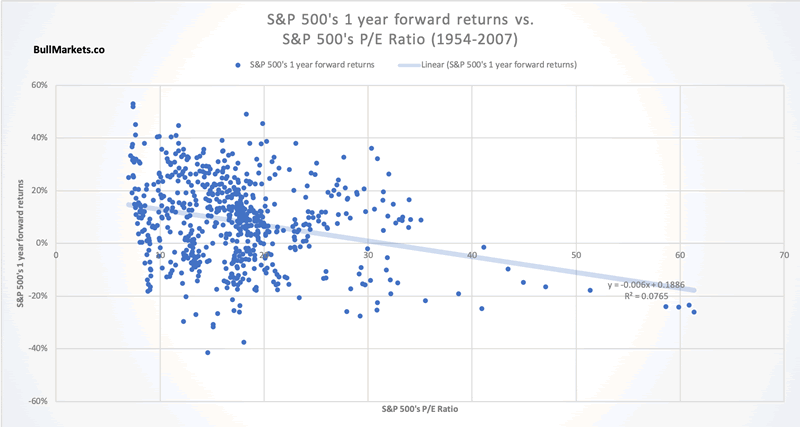 These are the S&P 500’s 1 year and 2 year forward returns vs. its valuation (P/E ratio). 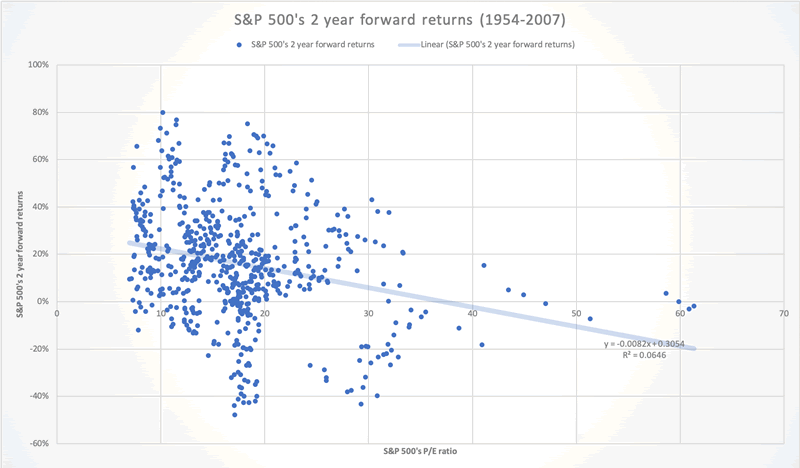 Notice how the correlation between the stock market’s valuation and 1-2 year forward returns is weak. This is what the permabears have been consistently wrong about. Imagine you are someone in 1995. You look at U.S. stock market valuations, listen to all the financial experts on TV and think “stocks are extremely overvalued, better sell now”. The U.S. stock market SOARED over the next 4-5 years, leaving you in the dust. 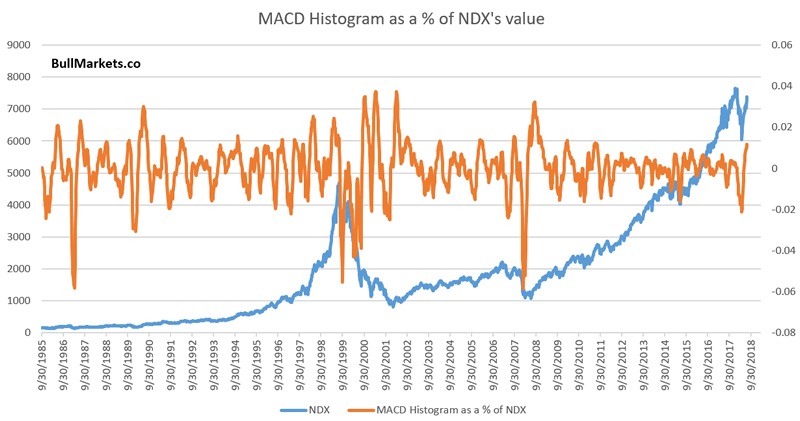 So how are valuations useful? High valuations create the preconditions for a bear market – necessary but not sufficient. 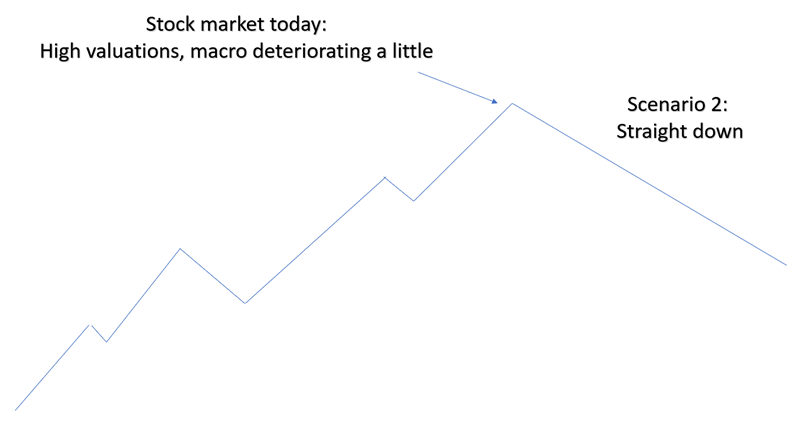 So what causes a bear market? Yes, valuations have been consistently high over the past 10 years. (Average valuations have been higher post-1995 and pre-1995 because inflation-adjusted interest rates are also lower). But not until 2019 have we seen the hallmarks of a recession in the making. Here’s a diagram to illustrate this concept. This is the stock market today. In an ideal world, your favorite guru would be able to predict with 100% certainty which scenario will play out. But since no one has a crystal ball, you can only trade on risk:reward. E.g. 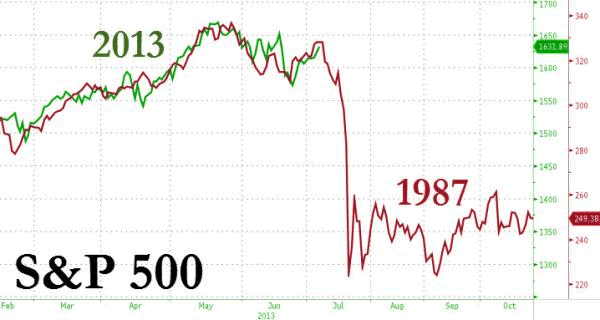 if you sell today, in a worst case scenario (stocks keep soaring), will the stock market at least fall to where you sold your stocks? The labor market starts to deteriorate. Meanwhile, the U.S. stock market is in a long term topping process. We are in the early stages of this process. Other economic indicators start to deteriorate. The bull market is definitely over, and a recession has started. A U.S. recession is not imminent right now, but this doesn’t matter. Official recessions happen after bull markets top, which is why we focus on leading economic indicators instead of GDP. The housing market is weak. Here’s Housing Starts, New Home Sales, and the NAHB homebuilder index. The labor markets are no longer improving. Here’s Initial Claims, Continued Claims, and the Unemployment rate – all of which are extremely low. While the deterioration in labor markets isn’t significant, it has started. For example, you can see that Continued Claims has somewhat trended upwards since October 2018. 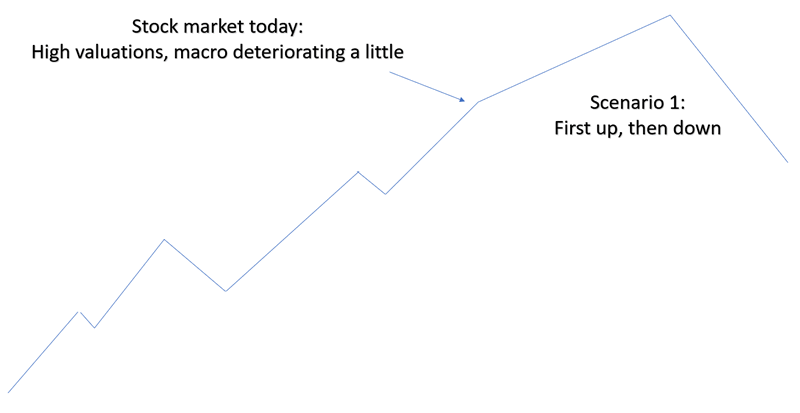 This is how the 4 major bear markets from 1950 – present started. The 10 year – 3 month yield curve inverted on Friday. The 10 year – 3 month section of the yield curve is a better timing indicator than other sections of the yield curve, such as the 5 year – 2 year or 10 year – 2 year. 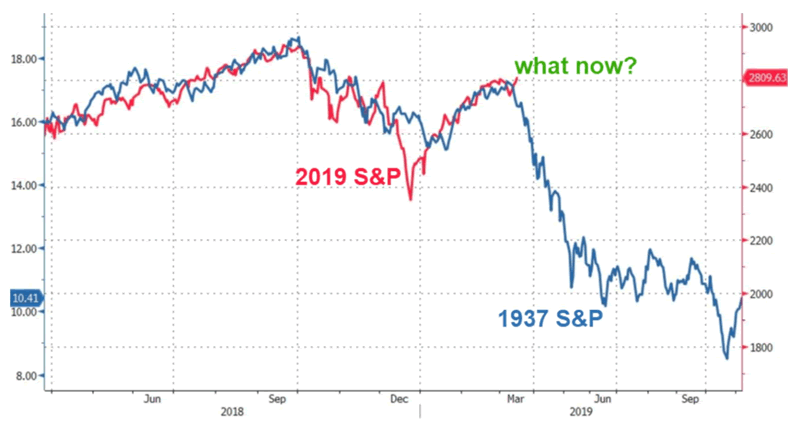 Here’s what happens next to the S&P 500 when the 10 year – 3 month yield curve inverts for the first time in each economic expansion. 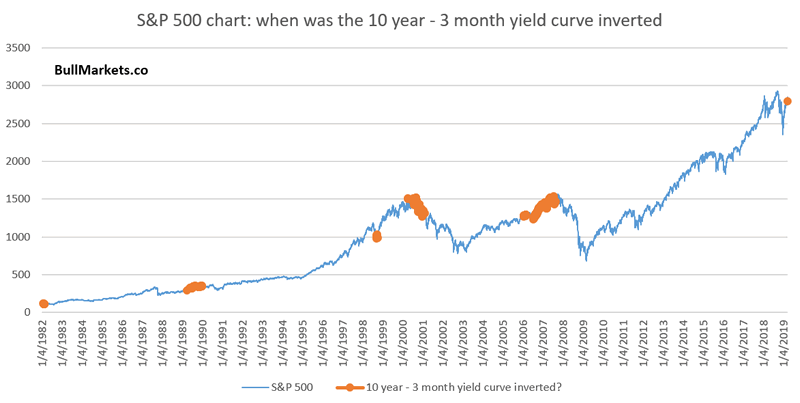 The following chart indicates risk:reward for the stock market after each 10 year – 3 month yield curve inverts. We compare the maximum the S&P can rally until the next recession-driven stock market decline vs. the % of the eventual S&P 500 decline. 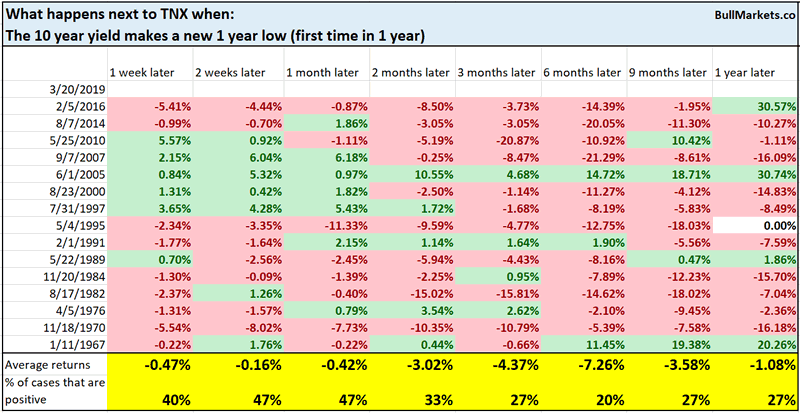 As you can see, the S&P often continued to go up after the 10 year – 3 month yield curve inverts. But every case saw the S&P at least fall back to where it was when the yield curve first inverted. While almost all parts of the Treasury yield curve are flattening, the 30 year – 5 year section of the yield curve is actually steepening right now. A steepening yield curve late-cycle is worse than a flattening yield curve. The yield curve typically steepens towards a recession when the Fed is about to cut short term rates. We can probably expect long term yields to keep falling while the Treasury yield curve continues to flatten. The 10 year yield fell to a 1 year low on Wednesday. This is not a good sign for interest rates. Approximately 37.5% of the yield curve (3 months, 1 year, 2 years, 3 years, 5 years, 10 years, 30 years) has become perfectly inverted. *Perfectly inverted = when each longer term rate is lower than the next shorter term rate. The end of a bull market is always very tricky to trade. The stock market can go up a lot in its final year, even if the macro economy is deteriorating. That’s why it’s better to focus on long term risk:reward instead of trying to time exact tops and bottoms. Even when you think the top is in, the stock market could very well surge for 1 more year. 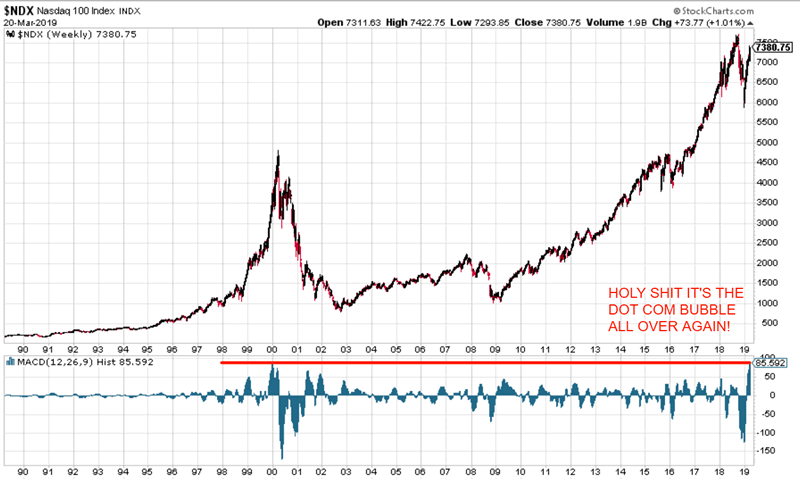 (Just ask the people who thought that the dot-com bubble would end in 1998. It lasted another 1.5 years). 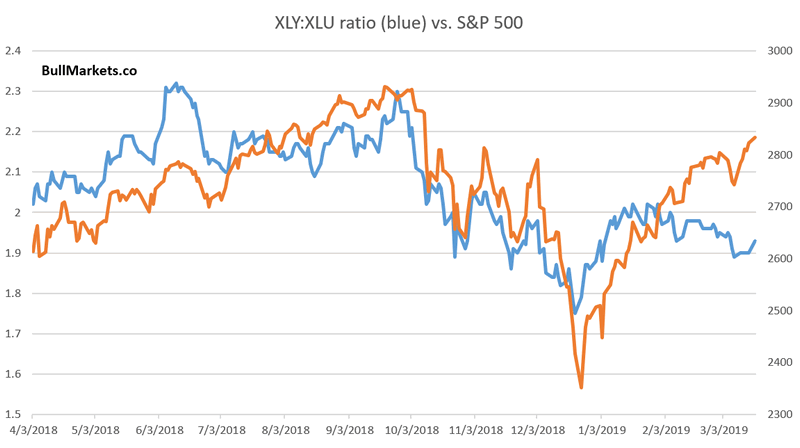 As the long term bearish case becomes clearer over the next few months, one would expect the Bull Markets blog to focus more on bearish content. Far from it. We will continue to explain all the facts, both bullish and bearish. At every point in time there will ALWAYS be bullish factors and ALWAYS be bearish factors. You will never have a case in which 100% of the factors are bullish or 100% of the factors are bearish. What many financial experts do (of which the permabears are most egregious) is to ONLY mention the factors that support their bull/bear case, and completely ignore all the factors that go against them. The correct thing to do is list all the bullish factors and list all the bearish factors. Then explain why certain factors are more important than other factors. With that being said, here are some long term “bullish/bearish factors” presented by financial experts that don’t really worry me. The Dow Jones Industrial Average has made a “golden cross”, whereby its 50 dma rose above its 200 dma. Traditional technical analysis sees this as a bullish sign for the stock market. Interestingly enough, the Dow has a slight short term bearish lean which has played out through the stock market’s sudden drop on Friday. These analogues aren’t very useful. When you squeeze, compress, stretch, and change the scales, you can always make the S&P 500 “look like” it’s doing whatever fits your preconceived bias. If the long term bearish case is valid, why are these bearish arguments not valid? Because doing the right thing for the wrong reason is no different from just getting lucky. You should do the right things and make the right predictions for the right reasons. The human mind has many biases and flaws. 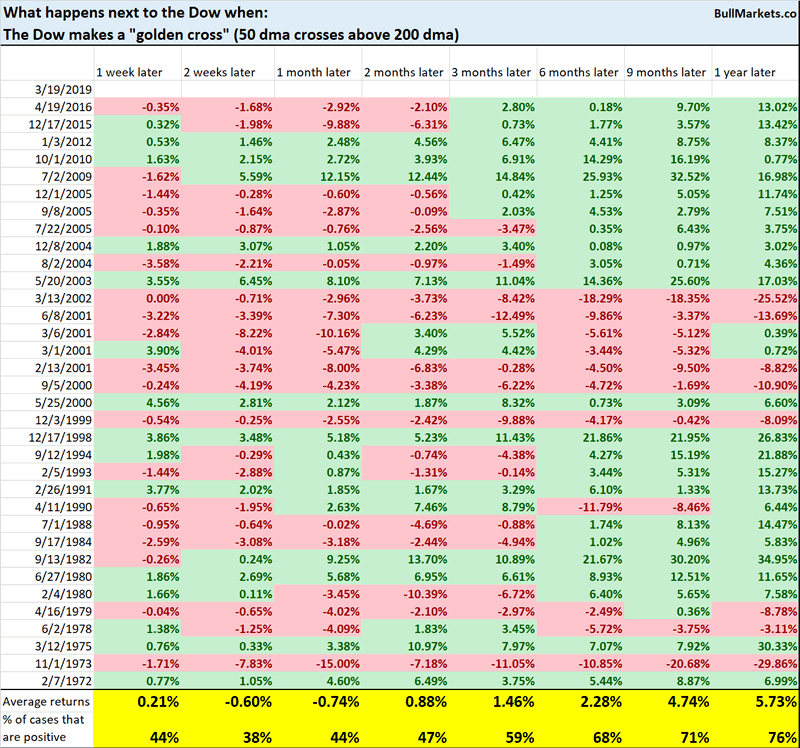 In terms of investing, I think the worst one is “recency bias”, which is the tendency to remember recent events more vividly, thereby exxagerating the probability that a recent event will occur again. An entire generation of investors and traders have been scarred by 2000-2002 and 2007-2009. Hence, a lot of traders and investors think “the next one” will be just like (or worse) than 2008. I think the next recession and bear market will be more mild than the 2007-2009 bear market. History rarely plays out the way most people think it will. For a really contrarian way of thinking how the next bear market will play out, see Jeremy Grantham’s interview with CNBC.